An essay regarding my thruhike of the Appalachian Trail appeared on the cover of the Travel section of The Washington Post on February 21, 2016. For the “Obsessions” column in the October/November 2018 issue of National Geographic Traveler, I wrote about thruhiking, tied to the 50th anniversary of the National Scenic Trails system. 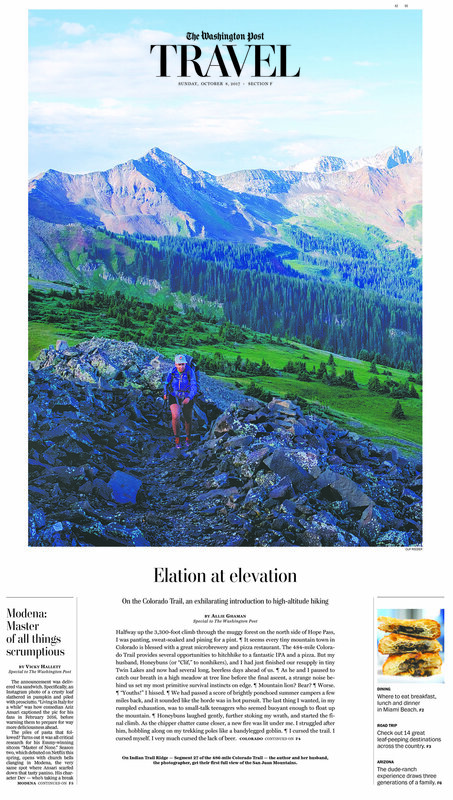 An essay regarding my thruhike of the Colorado Trail appeared on the cover of the Travel section of The Washington Post on October 8, 2017. A Q&A with author Sarah Vowell regarding her new book, Lafayette in the Somewhat United States. A story about local children’s author Phyllis Reynolds Naylor, who added a long-awaited installment in her Shiloh series. An interview with local children’s writer and illustrator Rashin Kheiriyeh, who adapted a Rumi folk tale for contemporary English-speakers.